During these days, Saraswathi puja and Ayudha Puja are performed. The Goddess Saraswathi is worshipped as the Goddess of Learning, the deity of Gayathri, the fountain of fine arts and science, and the symbol of supreme vedantic knowledge. The importance of Ayudha Puja (the worship of implements) on this occasion may be due to the fact that on the Vijayadasami day, Arjuna took his weapons, which he had hidden in a Vani tree in order to lead a life in disguise for the promised period of exile. It is believed that one who begins or renovates his learning to work on the Vijayadasami day will secure a grand success as Arjuna did in Kurukshetra war. 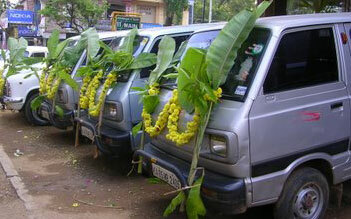 Bommai Kolu is traditionally a women's festival that Tamilians celebrate during Dasshera. 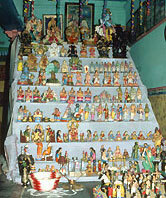 Every year, a series of steps is set up and kolu bommai or dolls are displayed. These dolls typically depict gods or village scenes and weddings. A kolu can be as simple or as elaborate as one likes. The woman of the house invites other women to come inspect the kolu, eat a few snacks, exchange a little gossip and go home with a couple of small goodies. During this time, the girls and women make rounds from house to house during those nine days of Navrathri. Sundal is a delicious confection made from bean sprouts and coconut that is traditionally served at kolu. Women set up decorated planks in a corner and place on it all the dolls in the house. This beautiful clay figurines of gods and goddesses are worshipped during Navaratri, viewing art as Divinity. Women traditionally exchange gifts of coconuts, clothes and sweets.